Look at this sweet face! Leo was a very happy boy on his 5th birthday and with great reason. 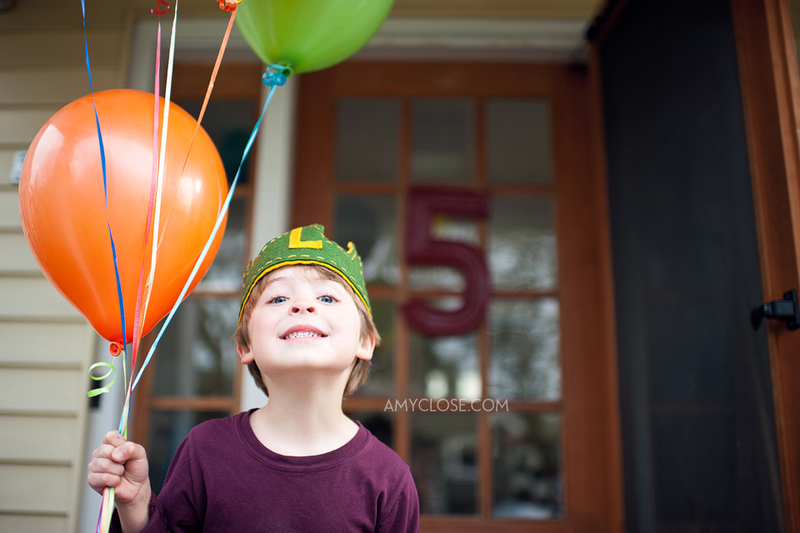 He had balloons galore, a giant “5”, a train cake, family, friends, gifts, and (drum roll) a Penny’s Production puppet show! This riveting show gained every party guest’s full attention…the highs and lows, the laughs, the tears, the drama! It was quite a thrill. Leo is one lucky little lad and in-turn, brings so much JOY to all that know him. I think one day, he will look back on this milestone birthday very fondly. I had SO MUCH fun myself, photographing this special moment in time, and sharing in the brilliance and memories being made. 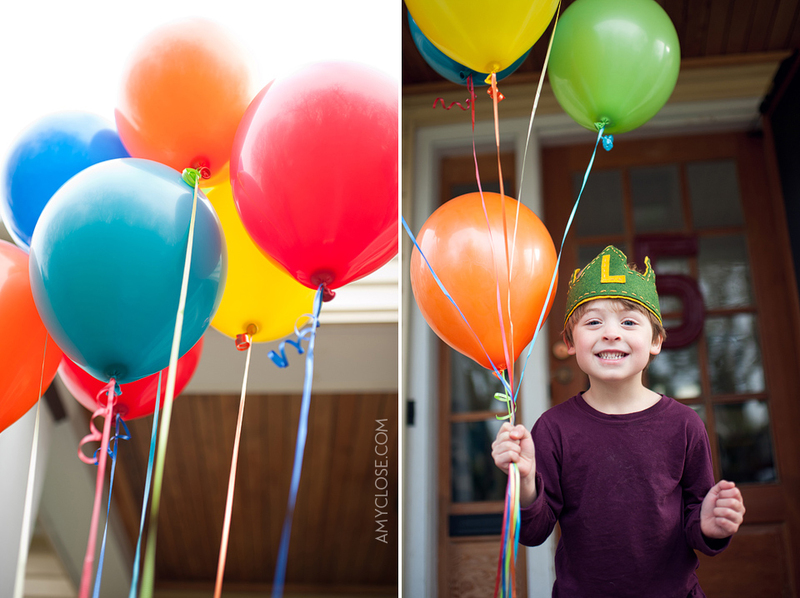 Happy 5th Birthday Leo! Enjoy. Please become a fan on Facebook to keep current on promos, updates, and drawings for free sessions. Just click on the *like* button in the box to the right! Thank you ever so kindly. I can’t thank you enough Amy! These photos are just awesome and really capture the magic of that sunny December day. Thank you for being in our lives and for sharing your passion for photography with us. You are an incredible photographer with a kind and generous heart! Thank you for all you do and thank you for being you! Can’t really top Anne’s post, but you are awesome! Great pics!!! Looks like a lovely birthday party! These photos are fabulous! I see the ‘pure joy’ on Leo’s face. Love cousin Celia staying close too. My favorite is the “blow out the candles” image with the whole family. Leo with the puppet is another wonderful photo. Anne, did you create the awesome train cake? You and Oona will have to get together for some baking! I need to find an “Amy” for my next party in Dar es Salaam….Joe will 10 and is planning a neuf gun battle party…unless we can sway him to something a bit more to his mother’s liking. Wow!!!! That is one of the most awesome birthday cakes I’ve ever seen!!! Looks like it was a really fun party…love the puppet show idea!! 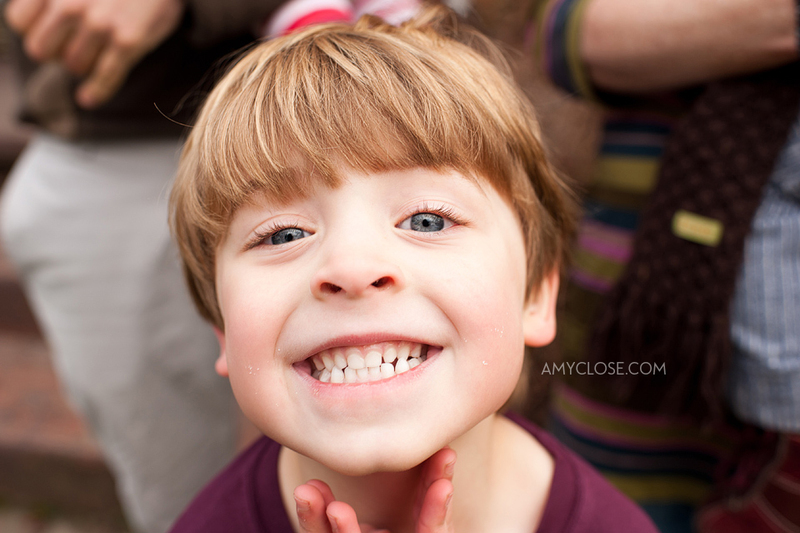 I love how Amy’s photos really capture all the bright and beautiful colors on a lovely sunny day!! Happy Birthday Leo!! this is absolutely beautiful. the photo of leo about to blow the candles out with anne and scott in the background brought tears to my eyes, just beautiful!